Encouraged by Infosys’ decision to set up a tech centre in his state and generate 2,000 jobs, Indiana Governor Eric Holcomb will lead a high-powered trade delegation to India later this year with the sole objective of attracting more Indian business, particularly IT companies. “I’m looking forward to travelling to India, probably in the fall, before the winter,” Holcomb told PTI in an exclusive interview in his office at the State Capitol. Holcomb, who succeeded Vice-President Mike Pence as Indiana governor, said he wanted to travel to India soon after his inauguration early this year but pressing engagements and now the summer prevented him from doing so. 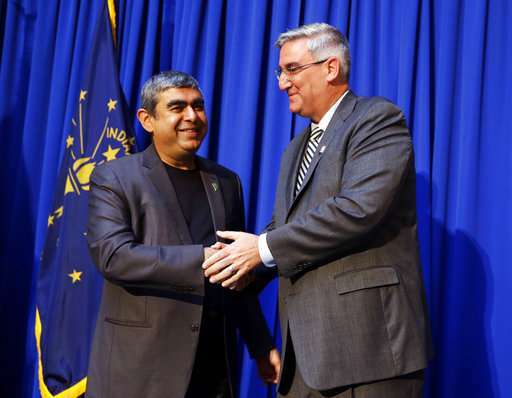 Holcomb, who would be the first Indiana governor to visit India, said he would be looking to grow Indiana’s presence and strengthen its friendship and partnership with companies headquartered in India. And “that’s why this partnership, with not just Infosys but the other companies that we discussed, are so important. Because it is the future. This knowledge economy is the future and it’s exciting to launch new efforts here on Hoosier soil,” Holcomb told PTI. He said he started working towards attracting Indian companies to his state on his inauguration itself when he met Indian Ambassador to the US Navtej Sarna, who attended the event. The Infosys story, he said, started a few months ago. “But it has come together very fast. We try to operate on the speed of business, not the speed of government. That was recognised by Infosys and everyone that was working together on this project,” he said, adding that he had tried to address every concern that Infosys might have had. The state of Indiana, the governor said, has over 800 foreign-owned businesses and counting. Looking at strengthening Indiana’s partnership with Infosys in the coming years, Holcomb said he wants to attracts other Indian IT companies. “Indiana is such fertile ground (for IT companies). We have world class universities where Infosys can, in fact, recruit that talent right out of Purdue, Indiana University... folks who are strong in the STEM subjects, science and technology, engineering and math, right here in their backyard now,” he said. Indiana is now an attractive destination, the governor declared, with low tax rates and a “reasonable predictable regulatory environment so there’s real certainty when you invest in the state of Indiana and our people“. “And we do as well in the companies that come here and that’s why we’re still blooming and continuing to outpace the national average,” he said. Eminent Indian American businessman Gurinder Singh Khalsa welcomed the announcement of Holcomb’s India visit later this year. Indiana is home to at least six India-based corporations. India ranks number 18 for Indiana’s exports. Last year, Indiana exports to India totalled $266.6 million. The top categories include engines, transmissions, pharmaceuticals, medical equipment and chemicals. India ranks 19 in terms of imports. Indiana imports from India totalled $348.8 million. Top categories are pharmaceuticals, engines ransmissions, motor vehicle parts and apparel.